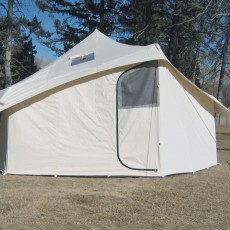 The development of the Glacier was inspired by the success of our Yellowstone tent and the demand for a larger model. The hexagon shape gives the tent 216 sq. 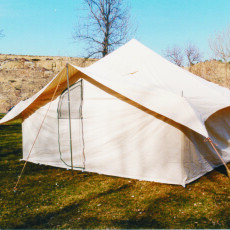 ft. of floor space and, even though the tent is 50% larger than the Yellowstone, it still can be set up by one person. Cut size of the Glacier is 17’8″, corner to corner, and 15’1″ wall to wall, each wall is 8’8″ wide. The design creates an openness not found in other tents and the single peak makes the tent more space efficient and easier to heat on fall hunting trips. As with the Yellowstone, the unique and functionally shaped overhanging roof design allows for great wind stability, protects the walls from exposure to wind and water, and provides a stable foundation to hold up to snow loads. Two large side windows with zippered flaps and another window in the door give an abundant amount of ventilation for the warmest nights. The door corner is a convenient 7’6″ and all other corners are a full 5′ high. The lightweight aluminum pole system is designed for strength and breaks down to 33″ for ease of packing. Other standard features include a zipper door, sod cloth, stovepipe shield with flap, carrying bag, stakes, ropes, and rope tighteners. 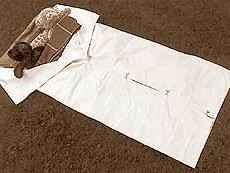 Also available as options are a fitted heavy duty XL-Tex fly and a vinyl laminated nylon snap-in floor. Like the Yellowstone, the Glacier is available in the 10.10oz. Marine Treated canvas and the 10.10oz. Marine/Flame canvas. Packable Pole Set (33″) 13 lbs. 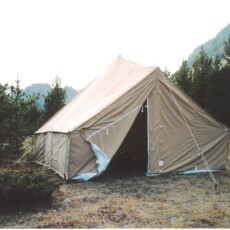 The total Glacier Tent Weight is 85 lbs. Marine and 90 lbs. in the Marine-Flame. It is a total of 216 sq. ft.